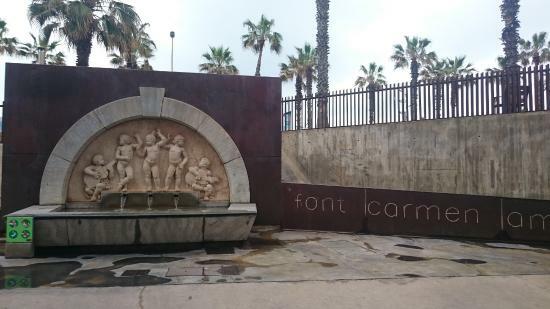 Under a sun typical of spring more than winter, in front of the Mediterranean sea and next to the shacks was inaugurated in the General Acedo Maritime Promenade a fountain dedicated by the city to Carmen Amaya in memory of her childhood in this place, where she ran barefoot so many times. When the water started to flow the great artist took it in a bowl and then, moved, started to cry. The Minister Mr.Pedro Gual Villalbí, Mr. Felipe Acedo and Mr. Miguel Mateu, witnessed the scene and hold back their tears with an effort. A lot of little gypsies, no more than seven years old, were also there in that happy hour. They maybe went unnoticed to the audience but we are sure that to Carmen Amaya they were the real protagonists of that beautiful ceremony. . I won’t say again: Carmen, when do you sleep? Will I say that again? Nervous, little, fine, sharp, dark lightning, I don’t think that anyone similar to Carmen Amaya existed in the flamenco world. Her art overflowed the very same art. She was like a call to the metaphysic trilogy of power, wish and knowledge. Soleares, seguidillas, alegrías…that crazy rhythm of millenarian culture was unique. Carmen, every night, exceeded the sound.